Tomorrow I will be a guest on ABC Television Network’s KATU during the 7am hour, sharing healthier halloween candy options! It may sound odd that “healthy” and “candy” are in the same sentence. While candy, as we all know, is not a health food, healthier candy options do exist. Today more kids and adults have food allergies, food sensitivities and dietary restrictions. With more people learning about “what’s in our food” we are also more passionate about real food and avoiding artificial ingredients. This means that the holidays, such as Halloween, can be a challenge. However, it doesn’t have to be! As the Healthy Grocery Girl® and a Registered Dietitian, I have done the research for you and I am sharing Organic, Vegan, Gluten-Free, Nut-Free and no artificial ingredient treats for a healthier Halloween. Halloween is already spooky enough, we do not need spooky ingredients! Traditional peanut butter cups contain hydrogenated oils also known as “Trans Fats”. Trans fats are artificially created and known as the worst fats you can eat. They are associated with increasing LDL (our bad cholesterol levels) and lowering HDL (our good cholesterol levels). Instead of traditional peanut butter cups, look for an option that is trans fat free and also does not contain the words “hydrogenated oils” in the ingredient list. 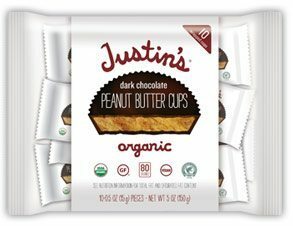 My favorite healthier peanut butter cups are from the company Justin’s. Their dark chocolate cups are organic, vegan, gluten-free and dairy-free. If you do not care for chocolate, perhaps you prefer hard candies. However, be careful of artificial food dyes in these types of treats such a Yellow No. 5. Artificial colors are synthetic and associated with hyperactivity, just to name a few concerns for consuming. 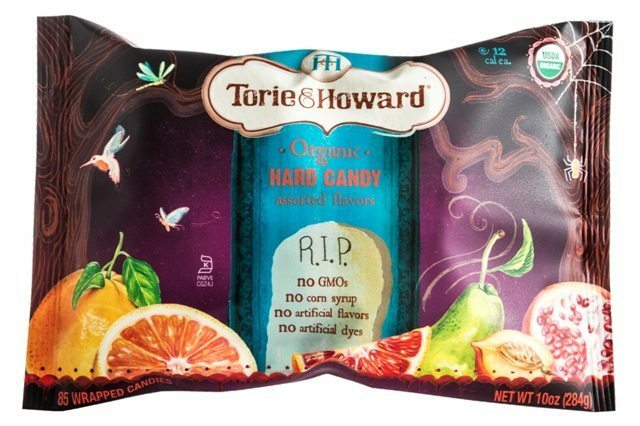 Torie & Howard hard candies are organic and do not contain any artificial colors or artificial ingredients. They also are corn syrup free. Artificial food dyes and high fructose corn syrup are also very common in lollipops. Select an all-natural or Organic option instead to avoid fake food coloring and processed sugars. High fructose corn syrup has been link to health problems such as weight gain and Type 2 Diabetes. 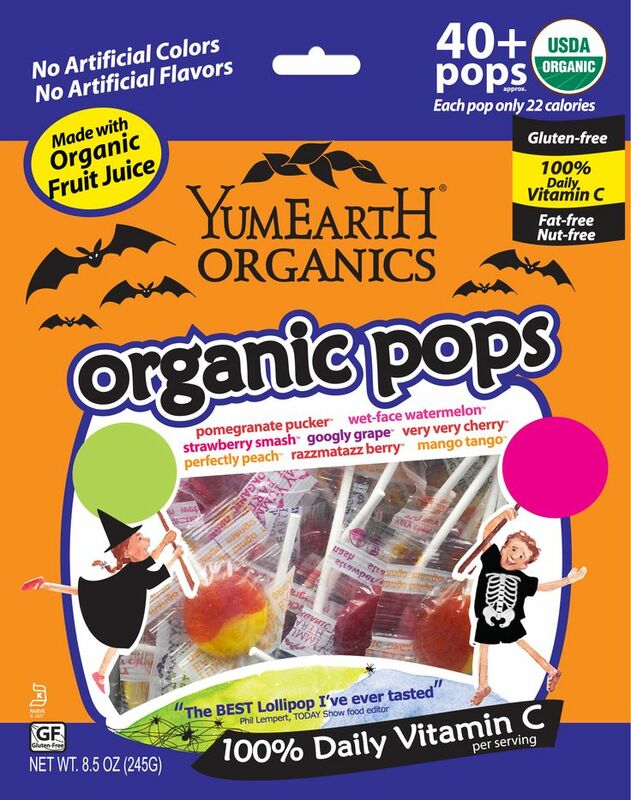 My favorite lollipops are from YumEarth Organics. These lollipops contain no artificial dyes and are made with real fruit extracts such as apples. 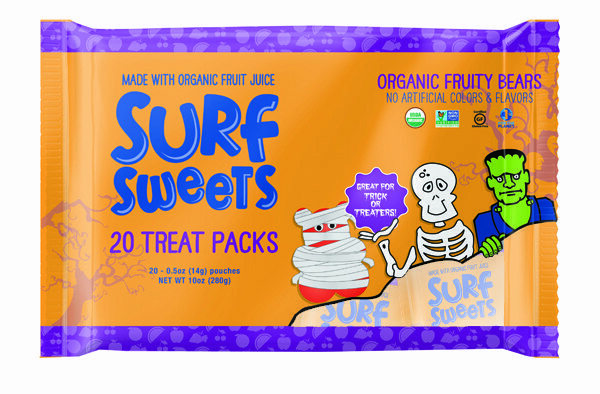 If you love a chewy sweet treat, try Surf Sweets. These gummy treats are organic, vegan, corn syrup free and are gluten-free. They have a delicious chewy texture and you would never guess that they are the healthier alternative! They are also NON-GMO Project Verified and the packaging is just adorable. 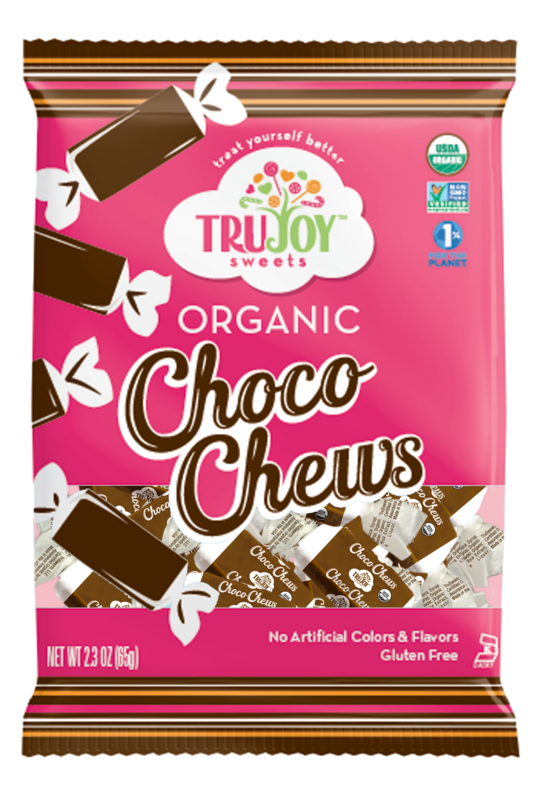 If you are looking to combine chewy and chocolate, my go to pick is TruJoy Sweets “Choco Chews”. They are a better alternative to the classic chocolate roll most of use grew up eating. This option instead is USDA Organic, NON-GMO Project Verified, gluten-free, Kosher and they do not contain any artificial ingredients. Although Halloween is one day out of the year, the candy often lasts for days after. There are so many options for healthier treats these days that are made without artificial ingredients. As a Registered Dietitian my advice is to enjoy a few pieces of candy around Halloween, just select options that are natural, Organic and void of spooky health inhibiting ingredients. All of these treats mentioned are available at your local health food store and many are available at mainstream grocery markets. You can also order all of these treats online. I suggest to visit each companies website to get more information on where they are sold near you. Tune in TOMORROW (Saturday, between 7-8am) to watch me share more information about these treats LIVE on ABCs KATU NEWS ! Connect with me on Instagram or Facebook for up to the hour information!